Cyclical Deficit - What Does It Mean? What is a cyclical deficit? What is the definition of a cyclical deficit? What does cyclical deficit mean? A cyclical deficit occurs in the bottom end of an economic cycle. The opposite of a cyclical deficit is a cyclical surplus. What is a deficit? A deficit occurs when a government spends more than what they take in.. in terms, expenses are greater than revenues, or, spending is greater than tax revenues. With a "structural deficit", a government will post a deficit no matter how strong their economy is. If things remain the same, expenses will always outpace revenues in the case of a structural deficit. With a cyclical deficit, this isn't the case. Cyclical deficits only occur when an economy weakens and revenues (such as tax receipts) drop. When the economy strengthens, the cyclical deficit will turn into a cyclical surplus. By definition, the cyclical surplus will pay for the money that needed to be borrowed in a cyclical deficit. 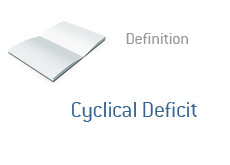 In short - a cyclical deficit occurs when the economy is in the bottom half of its cycle, while a cyclical deficit occurs when an economy is in the top half of its cycle.